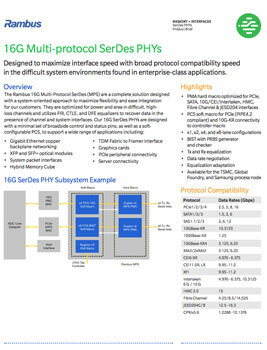 The Rambus 16 Gbps Multi-Protocol SerDes (MPS) PHYs are a high-performance serial link subsystem. Optimized for power and area in challenging, high-loss channels typical of copper backplanes and long runs of cable, our 16G MPS PHYs are ideal for networking, telecom and data center systems. The PHYs come complete with a PMA hard macro that supports a broad range of protocols and a PCS soft macro for PCIe that is PIPE4.2 compliant. They have a minimal set of broadside control and are configurable in x2, x4 and x8 lane configurations. This gives the PHYs improved flexibility and support for a wide range of applications. In order to improve system margin and performance, our solution features transmit and receive equalization, data rate negotiation, and equalization adaptation. This ensures that data is recovered even in the presence of channel and system interference.